I think that designing logos and identities are fun. They establish the soul of an initiative, be it an event or other project. My challenge with each of these was to work within branding standards established by a national organization so that the logos could showcase their lineage and be unique to the marketplace. An exclusive ladies-only event marrying spa services and products aimed at women in the coveted 25-54 age range. The concept was to capture these decision makers at home and work with an event that catered to them with pampering services, gourmet food, wine and products traditionally aimed at women. 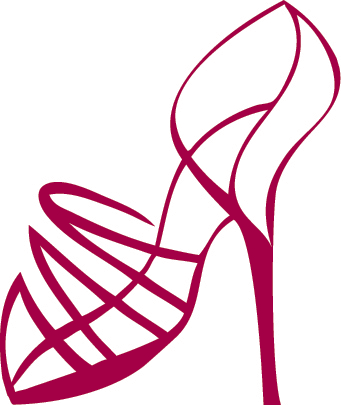 The shoe was hand drawn and adapted to the lettering in Adobe Illustrator. Red was chosen for its sensual connotations of love, passion and willpower, and its complementary qualities when paired with purple -- the signature color of the Alzheimer's Association palette. Looked to fill a niche in the Central New York athletics market with a one-of-a-kind indoor event in the month of April. Participants used an indoor pool, spin bikes and indoor track to complete the three legs of the event. Primary demographic was 25-45 year old women, which is the base of the local running and triathlete pool. The event name carries the implication that triathletes train like warriors, and that participants were taking up arms in the fight against Alzheimer's disease. The target market was beginner to intermediate athletes, or "weekend warriors." The color palette draws from the secondary colors dictated by the Alzheimer's Association, while the slab serif font signifies power and strength. A staff member at the Alzheimer's Association designed the concept of a standup comedy competition playing on the word "unforgettable." His vision for the brand was something that captured the fun spirit and entertainment nature of the event. I was on the steering committee of the Future Fund, an endowed fund of the Central New York Community Foundation, for a couple of years. During our monthly meeting, we discussed how the need for our own identity. It would be separate from the community foundation, but visually linked. This started, as most ideas, as a doodle in the margin of my notepad. After a little color matching, a hand-drawn leaf and tinkering with type, we had a logo.